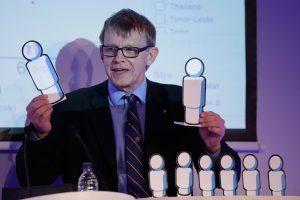 Hans Rosling, a Swedish statistician, doctor, and viral mathematics entertainer, died from pancreatic cancer on Tuesday. He was 68. Rosling rose to prominence after a series of TED Talks in which he used statistics and elaborate visuals to change the public’s perception of health and poverty. His first and most popular video — “the best stats you’ve ever seen” — has been viewed more than 11 million times. In it, he used his Trendalyzer — a data-visualization software bought by Google in 2007 — to dismantle popular myths about health. Rosling’s videos, which he described as “edutainment,” are particularly captivating because he took seemingly boring information — statistics on health, birth rates and wealth — and made them accessible. In addition to animated graphics, he used Ikea boxes, blocks, toys and even washing machines to physically demonstrate complicated population statistics. He often mentioned his concern about the prevalence of ignorance that stemmed from out-dated and inaccurate data. Rosling started his career as a doctor, and tackled diseases in Mozambique, Tanzania and Congo. There is where he first investigated the impact of poverty, politics and culture on disease rates. One analysis determined the cause of a crippling disease called konzo. Rosling found a link between the condition and the consumption of toxic cassava roots made without proper preparation. Rosling later returned to Sweden and became a professor of global health at the Karolinska Institutet in Solna, Sweden. Despite his prominence as a data statistician and educator, Rosling never lost his passion for medicine. In 1993, he co-founded the Swedish chapter of Médecins sans Frontièrs, also known as Doctors without Borders. @MJerven You can never understand the world without numbers, nor can you ever understand it with only numbers. In 2005, Rosling co-founded the nonprofit “fact-tank” Gapminder with his son and daughter-in-law. The organization curated data from organizations like the U.N., the World Bank and World Health Organization and then posted the information to the Gapminder website as an easily searchable repository. A year later, he gave his first of 10 TED Talks, which is still more than any other individual. Rosling’s son and daughter-in-law confirmed his death Tuesday on the Gapminder website.